Reserve valuable real estate on the desks of potential and existing clients. with branded custom desk accessories and paperweights. ePromos offers customizable paperweights, desk accessories, and laser-engraved glass awards. Gift these items at networking events, trade shows and as client appreciation gifts. Promote organization, creativity, and success among your departments. Get started by browsing our promotional products below! Our Solar-Powered Dancing Imprinted Flowers & Insects are sure to keep a smile on your face! This Felt Board Custom Sign has letters to display your own message. Makes a fun desk drop for employees! Use it to display inspirational messages and announcements. The Inspirational custom paperweight cube consists of Integrity, Quality, Attitude, Excellence, Teamwork, and your logo or message. Slant Top Crystal Custom Paperweight - 3.5"
The slanted top gives added depth and highlights to this custom paperweight. When someone deserves special recognition, present them with this beautiful glass apple with marble base custom award. This multi-faceted branded glass message pad captures both light and the attention of your customer. Dual function desktop logo paperweight and promotional letter opener made of heavy zinc alloy brush finished with spinning base for propeller look and feel. Add a little excitement to your desk with a solar powered logo flower that happily dances and moves all day. Make a clearly positive impression with this custom imprinted glass message pad holder gift set. These imprinted message dice each side delivers a motivating message. Roll for 36 different results. A promotional paperweight and magnifier Designed for MoMA by Page Goolrick that combines both form and function. Celebrate those special milestones with style & sophistication with this timeless magnifier custom paperweight filled playful star confetti. This handsome executive imprinted puzzle consists of a polished magnetic base and an eight piece magnetic puzzle cube. This penguins mini liquid wave custom paperweight will bring attention to any logo or message. This dolphin liquid wave custom paperweight will bring attention to any logo or message. This dolphin mini liquid wave custom paperweight will bring attention to any logo or message. This penguins liquid wave custom paperweight will bring attention to any logo or message. 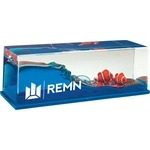 This clown fish mini liquid wave custom paperweight will bring attention to any logo or message. This clown fish liquid wave custom paperweight will bring attention to any logo or message. Make everyone feel like a winner with this attractive custom paperweight. MoMA Acrylic Custom Photo Frame - 4" x 6"
A masterpiece of design -- optical quality acrylic photo frame from the Museum of Modern Art's collection. A unique way to give back to your best customers. Make your company logo work for you with these Rockefeller style promotional bookends designed by Chris Collicott. MoMA Airplane Promotional Ruler/Paperweight - 12"
Transcend the ordinary a museum-quality, promotional ruler and paperweight from the MoMA Collection. These novelty desk accessories are sure to keep your company top of mind! Clients and employees love earning recognition for their accomplishments. Show them your appreciation with customized, engraved glass awards and paperweights. These memorable conversation pieces will sit prominently upon office desks and shelves. With your logo or brand name imprinted on it, your business will gain mass exposure. Our high-quality paperweights and novelty desk accessories offer mass appeal. Help people stay organized with branded bookends and magnetic paper clip holders. Give them inspiration and motivation with "executive decision" imprinted advice dice. Or help recipients keep their cool during hot summer days with a portable USB-powered desk fan. We have something for all office workers to ensure that your brand's visibility on employee desks. The ePromos design team can imprint your company logo or message onto any of these products. Create an exclusively customized item unique to your brand. Whether you’re searching for a traditional or novelty style gift, you’re sure to find the paperweight or desk accessory that fits the bill. Start browsing our inventory now or get in touch to get started!